View More In Train Cases. 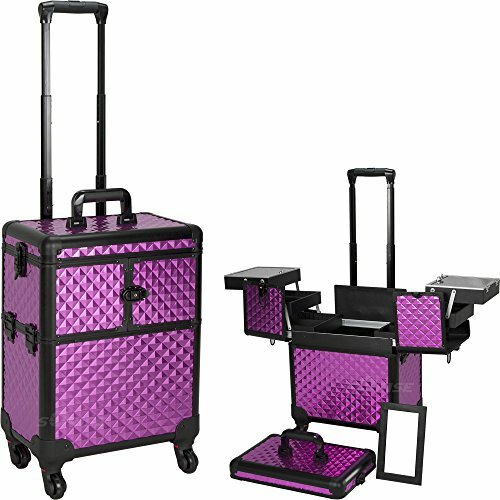 E6304DMPLB Pattern: Diamond, Color: Purple/Black New interchangeable series. Upgradable to any "E" series top cases. This line will allow customer to mix and match any "E" series cases according to their needs. Features: -Constructed of high quality aluminum with reinforced steel corners. -360 degree rolling wheel system. -Beautiful new black crocodile printing textured finish with black aluminum trimming. -Retractable/telescoping handle for extra durability with inline skate wheels for easy rolling and stitched plastic lining on extendable trays for easy cleaning. -Top lid with removable mirror. -Easy-slide extendable trays for easy access to center compartment. -Three extendable accordion trays on each sides with adjustable dividers. -Top extendable trays with lid and lock to prevent items to swing around. -30 days warranty. Specifications: -Bottom hollow space dimensions: 10" H x 8.75" W x 14" D. -Extendable tray dimensions: 1.25" H x 5.75" W x 7" D. -Overall dimensions: 21" H x 9.5" W x 14.5" D.
High quality aluminum finish and construction with reinforced steel corners for extra durability. Extendable tray dimension: 7"L x 5.75"W x 1.25"H each. Bottom hollow space dimension: 14"L x 8.75"W x 10"H.
Telescoping handle fully extended height: 40.25". Overall case dimension: 14.5"L x 9.5"W x 21"H.
If you have any questions about this product by Sunrise Cases, contact us by completing and submitting the form below. If you are looking for a specif part number, please include it with your message.